Snore Guards help to prevent the unpleasant sound that comes from having a narrowed airway when you sleep. Snore Guards position your jaw in a forward manner that prevents your airway from obstruction. This is a comfortable design which will alllow you and your spouse to enjoy a better nights sleep! Please call us today for a consultation and let us help you start sleeping better tonight!
" I was hesitant at first and put it off for a while, but I started the first night to wear it and I only kept it on for about an hour. The next night I wore it for two hours and eventually wore it all night. I am amazed at how well it has been working for me. I don't snore any more with my appliance on. I am able to breathe properly . I am finally getting the rest that I need to be ready for work and all of my patients that I need to see. 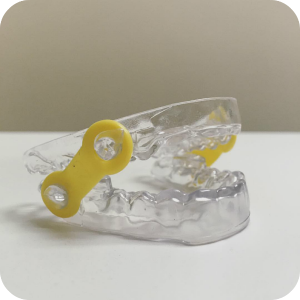 I am very satisfied with my snore guard and am thankful to Dr. Cheong for recommending it. It's the best thing that has really helped. I will definitely recommend it to people with my same issue. Thank you again, Dr. Cheong! "